Mozambique, officially the Republic of Mozambique (Portuguese: Moçambique or República de Moçambique, pron. IPA: [ʁɛ'publikɐ dɨ musɐ̃'bikɨ]), is a country in southeastern Africa bordering to the Indian Ocean in the east, Tanzania in the north, Malawi and Zambia in the northwest, Zimbabwe in the west and Swaziland and South Africa in the southwest. It is a member of the Community of Portuguese Language Countries and the Commonwealth of Nations. Mozambique's first inhabitants were San hunters and gatherers, ancestors of the Khoisani peoples. Between the first and fourth centuries AD, waves of Bantu-speaking peoples migrated from the west and north through the Zambezi River valley and then gradually into the plateau and coastal areas. The Bantu were farmers and ironworkers. Ilha de Moçambique was first discovered by Europeans in the late 1400s. After World War II, while many European nations were granting independence to their colonies, Portugal maintained that Mozambique and other Portuguese possessions were overseas provinces of the mother country, and emigration to the colonies soared. Calls for Mozambican independence developed apace, and in 1962 several anti-colonial political groups formed the Front for the Liberation of Mozambique (FRELIMO), which initiated an armed campaign against Portuguese colonial rule in September 1964. However, Portugal had occupied the country for more than four hundred years; not all Mozambicans desired independence, and fewer still sought change through armed revolution. Despite arms shipments by China and the Soviet Union, FRELIMO and other loosely linked armed guerilla forces proved no match for Portuguese counterinsurgency forces. After ten years of sporadic warfare, FRELIMO had not made appreciable progress towards capturing either significant amounts of territory or population centers. After a socialist-inspired military coup which overthrew the quasi- fascist Portuguese government of Antonio Salazar in 1974, Portugal determined to grant independence to its remaining colonies. Mozambique became independent on June 25, 1975. The last thirty years of Mozambique's history have reflected political developments elsewhere in the 20th century. Following the coup in Lisbon, Portuguese withdrew from Mozambique. In Mozambique, the military decision to withdraw occurred within the context of a decade of armed anti-colonial struggle, initially led by American-educated Eduardo Mondlane, who was assassinated in 1969. When independence was achieved in 1975, FRELIMO rapidly established a one-party state allied to the Soviet bloc and outlawed rival political activity. FRELIMO eliminated political pluralism, religious educational institutions, and the role of traditional authorities. The new government, under president Samora Machel, gave shelter and support to South African ( ANC) and Zimbabwean ( ZANU) liberation movements while the governments of first Rhodesia and later apartheid South Africa fostered and financed an armed rebel movement in central Mozambique called the Mozambican National Resistance (RENAMO). Hence, civil war, sabotage from neighboring states, and economic collapse characterized the first decade of Mozambican independence. Also marking this period were the mass exodus of Portuguese nationals and Mozambicans of Portuguese heritage, a weak infrastructure, government nationalization of privately owned industries and economic mismanagement. During most of the civil war, the government was unable to exercise effective control outside of urban areas, many of which were cut off from the capital. An estimated 1 million Mozambicans perished during the civil war, 1.7 million took refuge in neighboring states, and several million more were internally displaced. On October 19, 1986 Samora Machel was on his way back from an international meeting in Malawi in the presidential Tupolev Tu-134 aircraft when the plane crashed in the Lebombo Mountains, near Mbuzini. There were nine survivors but President Machel and twenty-four others died, including ministers and officials of the Mozambique government. The United Nations' Soviet delegation issued a minority report contending that their expertise and experience had been undermined by the South Africans. Representatives of the USSR advanced the theory that the plane had been intentionally diverted by a false navigational beacon signal, using a technology provided by military intelligence operatives of the apartheid government. Machel's successor, Joaquim Chissano, continued the reforms and began peace talks with RENAMO. The new constitution enacted in 1990 provided for a multi-party political system, market-based economy, and free elections. The civil war ended in October 1992 with the Rome General Peace Accords, brokered by the Community of Sant'Egidio. Under supervision of the ONUMOZ peacekeeping force of the United Nations, peace returned to Mozambique. By mid-1995 the more than 1.7 million Mozambican refugees who had sought asylum in neighboring Malawi, Zimbabwe, Swaziland, Zambia, Tanzania, and South Africa as a result of war and drought had returned, as part of the largest repatriation witnessed in Sub-Saharan Africa. Additionally, a further estimated four million internally displaced persons returned to their areas of origin. 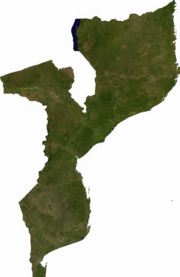 Mozambique is divided into ten provinces (provincias) and one capital city (cidade) with provincial status. 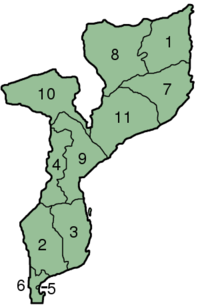 The provinces are subdivided into 129 districts (distritos). At 309,475 square miless (801,590 km²), Mozambique is the world's 36th-largest country (after Pakistan). It is comparable in size to Turkey, and is somewhat larger than the US state of Texas. In 1994 the country held its first democratic elections. Joaquim Chissano was elected President with 53% of the vote, and a 250-member National Assembly was voted in with 129 FRELIMO deputies, 112 RENAMO deputies, and nine representatives of three smaller parties that formed the Democratic Union (UD). Since its formation in 1994, the National Assembly has made progress in becoming a body increasingly more independent of the executive. By 1999, more than one-half (53%) of the legislation passed originated in the Assembly. Presidential and National Assembly elections took place on December 1-2, 2004. FRELIMO candidate Armando Guebuza won with 64% of the popular vote. His opponent, Afonso Dhlakama of RENAMO, received 32% of the popular vote. FRELIMO won 160 seats in Parliament. A coalition of RENAMO and several small parties won the 90 remaining seats. Armando Guebuza was inaugurated as the President of Mozambique on February 2, 2005. RENAMO and some other opposition parties made claims of election fraud and denounced the result. These claims were supported by international observers (among others by the European Union Election Observation Mission to Mozambique and the Carter Centre) to the elections who criticized the fact that the National Electoral Commission (CNE) did not conduct fair and transparent elections. They listed a whole range of shortcomings by the electoral authorities that benefited the ruling party FRELIMO. However, the elections shortcomings have probably not (also according to EU observers) affected the final result in the presidential election. The pronounced outcome of the parliamentary election and thus the distribution of seats in the National Assembly does not reflect the will of the Mozambican people and is clearly to the disadvantage of RENAMO. During the 1970s and early 1980s, Mozambique's foreign policy was inextricably linked to the struggles for majority rule in Rhodesia and South Africa as well as superpower competition and the Cold War. Mozambique's decision to enforce UN sanctions against Rhodesia and deny that country access to the sea led Ian Smith's regime to undertake overt and covert actions to destabilize the country. Although the change of government in Zimbabwe in 1980 removed this threat, the apartheid regime in South Africa continued to finance the destabilization of Mozambique. It also belonged to the Front Line States. In the years immediately following its independence, Mozambique benefited from considerable assistance from some western countries, notably the Scandinavians. USSR and its allies, however, became Mozambique's primary economic, military, and political supporters and its foreign policy reflected this linkage. This began to change in 1983; in 1984 Mozambique joined the World Bank and International Monetary Fund. Western aid quickly replaced Soviet support, with the Scandinavians countries of Sweden (EU Member since 1996), Norway, Denmark (EU Member since 1973) and Iceland. Plus Finland (EU Member since 1996) and the Netherlands within the European Union are becoming increasingly important sources of development assistance. Italy also maintains a profile in Mozambique as a result of its key role during the peace process. Relations with Portugal, the former colonial power, continue to play an important role as Portuguese investors play a visible role in Mozambique's economy. Mozambique is a member of the Non-Aligned Movement and ranks among the moderate members of the African Bloc in the United Nations and other international organizations. Mozambique also belongs to the African Union (formerly the Organization of African Unity) and the Southern African Development Community. In 1994, the Government became a full member of the Organization of the Islamic Conference, in part to broaden its base of international support but also to please the country's sizable muslim population. Similarly, in early 1996 Mozambique joined its Anglophone neighbors in the Commonwealth. It is the only nation to join the Commonwealth that was never part of the British Empire. In the same year, Mozambique became a founding member and the first President of the Community of Portuguese Language Countries (CPLP), and maintains close ties with other Lusophone states. 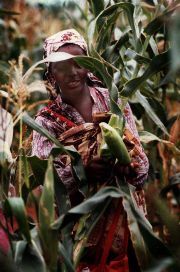 Women in Mozambique with maize. The official currency is the Metical (as of 2006, 1USD is roughly equivalent to 25 Meticais). US Dollars, Rands and more recently Euros are also widely accepted and used in current business transactions. The minimum legal salary is around 60 USD/month. The resettlement of war refugees and successful economic reform have led to a high growth rate: the average growth rate from 1993 to 1999 was 6.7%; from 1997 to 1999, it averaged more than 10% per year. The devastating floods of early 2000 slowed GDP growth to a 2.1%. A full recovery was achieved with growth of 14.8% in 2001. In 2003, the growth rate was 7%. The government projects the economy to continue to expand between 7%-10% a year for the next 5 years, although rapid expansion in the future hinges on several major foreign investment projects, continued economic reform, and the revival of the agriculture, transportation, and tourism sectors. More than 75% of the population engages in small scale agriculture, which still suffers from inadequate infrastructure, commercial networks, and investment. However, 88% of Mozambique's arable land is still uncultivated. The government's tight control of spending and the money supply, combined with financial sector reform, successfully reduced inflation from 70% in 1994 to less than 5% from 1998-99. Economic disruptions stemming from the devastating floods of 2000 caused inflation to jump to 12.7% that year, and it was 13% in 2003. The value of Mozambique's currency, the Metical, lost nearly 50% of its value against the dollar since December 2000, although in late 2001 it began to stabilize. Since then, it has held steady at about MZN 24,000 to US$1. Since July 2006 the currency is $1 is 25 (new) MZN. A new Metical was introduced on July 1st 2006. 1000 old metecais = 1 new Metical. US$1 = 25 Meticals. Both currencies will circulate until December 31, 2006. After that the old currency will not be valid but it will be redeemed by the Bank of Mozambique until the end of 2012. Imports remain almost 40% greater than exports, but this is a significant improvement over the 4:1 ratio of the immediate post-war years. In 2003, imports were $1.24 billion and exports were $910 million. Support programs provided by foreign donors and private financing of foreign direct investment mega-projects and their associated raw materials, have largely compensated for balance-of-payments shortfalls. The medium-term outlook for exports is encouraging, since a number of foreign investment projects should lead to substantial export growth and a better trade balance. MOZAL, a large aluminium smelter that commenced production in mid-2000, has greatly expanded the nation's trade volume. Traditional Mozambican exports include cashews, shrimp, fish, copra, sugar, cotton, tea, and citrus fruits. Most of these industries are being rehabilitated. As well, Mozambique is less dependent on imports for basic food and manufactured goods because of steady increases in local production. Mozambique's major ethnic groups encompass numerous subgroups with diverse languages, dialects, cultures, and histories. Many are linked to similar ethnic groups living in neighboring countries. The north-central provinces of Zambezia and Nampula are the most populous, with about 45% of the population. The estimated four million Makua are the dominant group in the northern part of the country; the Sena and Shona (mostly Ndau) are prominent in the Zambezi valley, and the Shangaan (Tsonga) dominate in southern Mozambique. Other groups include Makonde, Yao, Swahili, Tonga, Chopi, Shona, and Nguni (including Zulu). The country has also a small number of Caucasian residents, largely Europeans of Portuguese ancestry. During Portuguese colonial rule, a large minority of Mozamibicans of Portuguese descent lived permanently in almost all areas of Mozambique, and Mozambicans with Portuguese citizenship at the time of independence was about 250,000. Most of these left the region after its freedom in 1975. There is also a small mestiço minority of Mozambicans with mixed Bantu and Portuguese heritage. The remaining minorities in Mozambique claim heritage from India, Pakistan, Portuguese India and Arab countries. There are also some 7,000 Chinese. Portuguese is the official and most widely spoken language of the nation, because Bantus speak several of their different languages (most widely used of these are Swahili, Makua, Sena, Ndau, and Shangaan — these have many Portuguese-origin words), but 40% of all people speak it — 31%, mostly Bantus, as their second language and only 9%, mostly pure-blooded Portuguese and mestiços, speak it as their first language. Arabs, Chinese, and Indians speak their own languages (Indians from Portuguese India speak any of the Portuguese Creoles of their origin) aside from Portuguese as their second language. Most educated Mozambicans speak English, which is used in schools and business as second or third language. During the colonial era, Christian missionaries were active in Mozambique, and many foreign clergy remain in the country. According to the national census, about 20%-30% of the population is Christian (with Catholicism as the largest denomination), 15%-20% is Muslim, and the remainder adheres to traditional beliefs. Among the main Protestant churches are Igreja União Baptista de Moçambique, the Assembleias de Deus, the Seventh-day Adventists, the Anglican Church of Mozambique, the Igreja do Evangelho Completo de Deus, the Igreja Metodista Unida, the Igreja Presbiteriana de Moçambique, the Igreja de Cristo and the Assembleia Evangélica de Deus. The Roman-Catholic church established three archdioceses ( Beira, Maputo and Nampula). Under Portugal, educational opportunities for poor Mozambicans were limited; 93% of the Bantu population was illiterate, and many could not speak Portuguese. In fact, most of today's political leaders were educated in missionary schools. After independence, the government placed a high priority on expanding education, which reduced the illiteracy rate to about two-thirds as primary school enrollment increased. Unfortunately, in recent years school construction and teacher training enrollments have not kept up with population increases. With post-war enrollments reaching all-time highs, the quality of education has suffered. As a member of Commonwealth of Nations, most urban Mozambicans are required to learn English starting high-school, and junior high in the more advanced schools. According to the 1997 Second General Population and Housing Census, the religions of the polled population were as follows: 24.2% identified themselves as Roman Catholic; 24.25% claimed to not be affiliated with a religion (many of these perhaps maintain cultural bonds with Animism or tribal religions); 17.8% of the population were cited as Muslims, 11.45% as other non-Catholic Christians (mostly of various Protestant denominations), 18.7% adhering to Zionism (a syncretic faith that combines Christian and traditional African religious elements), and 3.6% as "other". The wide range of religious affiliations can be partially attributed to a large number of influences in the country, from the more Protestant South African churches' influence in southern Mozambique, and the Portuguese Catholic influence, traditional tribal religions, and historic Muslim ties.